Successfully Added GPS Navigation Unit with Touch Screen - Portable 3.5 Inch System to your Shopping Cart. GPS navigation unit with touch screen display. 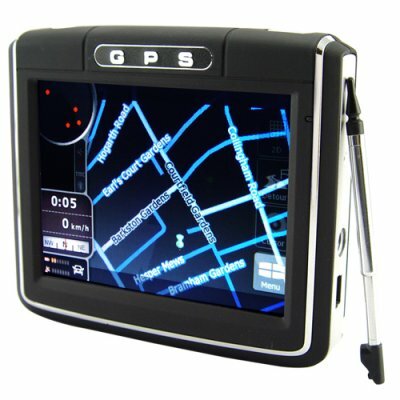 Portable all in one GPS system for navigation while driving around town or carried around as a travel navigator. Do you want the convenience of a modern GPS unit but also want to be able to take it with you everywhere, not just fixed inside your car or on your computer? Well then here is the answer you have been looking for - a portable GPS navigator with a crystal clear 3.5" display and interactive touch screen control for maximum ease of use when you are using it while on the go. With a locking suction adjustment bracket and mounting plate, this model allows for easy installation in your car and is also designed to be detached so you can use it as an all-in-one portable unit. So in addition to being a great navigator when you are driving, this unit can also be a great navigation system for bikers, hikers, or travelers. Small enough to fit into your backpack, purse, or large pocket, it is easy to carry around while out and about on a day of travels and allows you to enjoy your day-trip without having to worry about getting lost. So how exactly does this unit work? The unit comes with an interactive color icon touch screen menu that allows easy access to the rich featured G.P.S. navigation system as well as the other media tools included inside the unit - the menu system looks similar to what you find on a modern portable media player. You simply press the button for the function you want and the system guides you through the rest of the process. The CVSB-CS08 runs all of today's popular G.P.S. software that is compatible with the Win CE mobile device OS. In addition to its advanced G.P.S. features, this unit also includes multimedia features such as music and video players, EBook reader, and a photo viewer. Since it measures only 80mm wide, the CVSB-CS08 truly can be used as a portable digital media unit as well as great GPS navigator. The direct to our customer wholesale price makes this unit perfect for the resale market, VAR and OEM market, or simple for your own personal/company use. It is in stock now and available for your single piece drop-shipping or bulk stock orders. Portable GPS Navigation Unit with 3.5 inch Display. This new type of GPS navigator can be used as both a modern vehicle GPS unit and can also be taken out of the car and put into your bag or backpack so you can use it in your daily life in the city or country. This GPS unit includes an SD card with simple evaluation GPS maps - you will need to purchase GPS map software for this product to function properly as a navigator. After an extensive review of the available global GPS map providers we have found that the best GPS maps for each region of the world, including Europe, South America, Arabia/Middle East and North America, are usually found in the users own country. Therefore we encourage you to buy GPS map software from a supplier in your home country. This model is compatible with most brands of GPS software (including Tomtom, Route66, iGo, Navigator, Destinator, Nav N Go, etc) - however hardware specific software such as Garmin may not run on this unit. As the wholesaler, Chinavasion provides the GPS-enabled hardware only, not the software. Chinavasion provides no warranty or customer support regarding GPS software. Chinavasion cannot provide downloads / links / advice regarding GPS software. Any software installation you undertake should be performed or supervised by a professional. Makes the perfect gift for your friend, family member, or good friend. The suction cup locking mechanism is designed to be secure while not scratching up your car. Does this unit work in my home language of ___________ (Spanish, French, German, Portuguese, ... ) ? The display and voice languages the GPS unit uses for navigation and map display depends on the GPS maps being used. Most map software comes with a wide selection of language choices, which means both the display and sound (voice) will be in your preferred language. However, you should carefully select and buy the map software that is best suited for your region of the world. Does this unit need an external antenna? No. No external antenna is usually necessary because the CVSB-CS08 has a built in antenna which allows it to receive rich signal reception. This deluxe portable GPS model does include an external antenna jack that can be used if you often drive in dense urban centers or forested terrain and find you need to boost your units signal. I have purchased this GPS, and I am surprised at the good quality of the I Go software which is provided with the product, it will do fine, no need to purchase any additional software, at least not in Netherlands. Sound is good, usable, works just fine. on 2009-05-05 05:21:35 excelente produto! !